I'm incredibly blessed to have many friends who are moms. It's encouraging, humbling, and inspiring to observe them as they parent their children. There's nothing better than swapping birth stories, or hearing "that's totally normal!" when you feel alone in your struggles as a mother. One of these amazing women is my friend Annie, who blogs at Luv U to the Moon...and Back. We work together at Youth With A Mission in Montana, and even before I was a mom, I was so inspired by Annie's heart for her children. Annie absolutely oozes love for her daughters! She believes the best about them, even in the difficult stages, which is not easy to do. I admire Annie and look up to her as a mother, so I wanted you guys to hear from her today! She has so much honest wisdom to share. 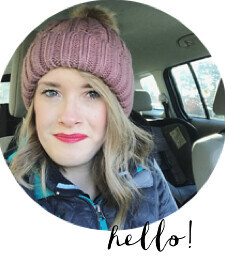 I asked Annie a few questions about her family life and her blog, and she is graciously sharing with us today! (Including a recipe that I am dying to try!) Take it away, Annie! Tell us a little bit about your family and your blog! I could talk about my family all day long, I love them so much! I met my husband Justin in 2007 while we were both doing a nine month Bible school with a missions organization called Youth With a Mission. We started dating in 2008, were married in 2009, had our daughter Ella in 2010 and sixteen months later our daughter Bennet was born on Christmas day of 2011. As you can imagine it has been a pretty wild journey for us so far! My husband and I have had many challenges over the past few years, but God is using these challenges to shape us, and bring great personal growth about in our lives. We are working hard daily at having the best marriage we can and being the best parents we can be. We fall short every day but there is always room for grace in our home. The thing I love most about us as a family is that we aren't afraid to be silly! It is not uncommon to find the four of us dancing around the kitchen, or getting into tickle fights in the living room. Our house is filled to the brim with zaniness and affection and I wouldn't have it any other way! 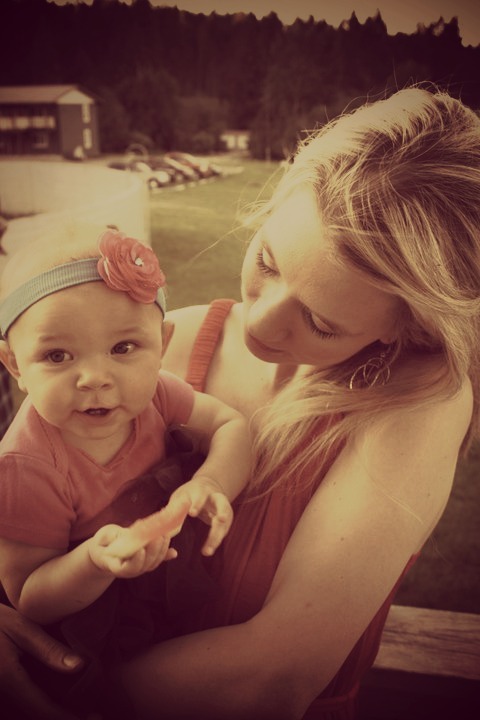 My blog is all about celebrating the journey of wife and motherhood- imperfections and all. It was truly born out of my love for my girls. Raising my them has filled me to overflowing with love and personal testimony of God's faithfulness. I felt compelled to share that love and testimony with the world. Being a wife and mom has been the biggest learning curve and most amazing experience of my life! I have been so encouraged by the friends and other moms who have poured into my life during this season. I thought maybe I could pay it forward and encourage other moms by sharing the things that I am learning with them. At times motherhood can be isolating and we just need to be reminded that we aren't alone in the challenges and triumphs that we are going through. I want to inspire my readers with fun ideas, recipes, and reflections from my own personal experiences and growth. What has surprised you about being a mom? I think the thing that has surprised me most about being a mom is how much I love it!!!! I know that sounds funny, but I never was sure if I even wanted to be a mom. I knew it would require things of me that I wasn't sure if I wanted to give. Now that I am a mom, I absolutely love it, and am glad (though it is hard at times) that it requires me to give of myself. Motherhood has brought me more joy and a greater sense of purpose than I ever thought it would. What have you struggled with as a young mom? My greatest struggle as a young mom has probably been perfectionism and comparison. Before I was a mom, I had all these lofty ideas about the kind of mom I would be, and all the things I would still be able to do after having kids. It turns out that I am the total opposite of how I thought I would be, (which is actually a good thing, I think) but it was a long process of grieving and seeking God in order to come to terms with it all. I've had to learn not to care what others think about me and my abilities as a mom, and to stop comparing myself to the women who can do all the things that I can't. God gives different moms the grace to do different things, depending on what they are called to. I have had to learn to not think I am a failure because this mom or that mom can do this thing and or that and I can't. It doesn't mean that I am lacking, just that I am different from them and that is ok.
What's one of the funniest things that has happened, in terms of parenthood? The funniest thing...hmmm?...Parenthood is just so unpredictable! Sometimes the craziest things happen and you just have to laugh about them! My funniest stories involve poop and vomit, so I will spare you the details. Besides those stories, I would have to say that my daughter Ella is the funniest thing! She is so entertaining! It is hysterical to watch her explore her world and develop into her own little person. She is such a little goof ball, and makes my husband and I laugh daily! I also asked Annie to share one of her favorite recipes with us! It sounds amazing! For me, quick dinners usually involve something frozen from Costco ;-). But if you have a little time in advance, this simple steak marinade is seriously amazing! I know most of us aren't in a position to have steaks every night, but if you want to woo your hubby with a steak dinner for just the two of you, or maybe are having some special guests over, this marinade is the way to go! I am telling you, melt in your mouth delish and so easy! It works for any cut of up to 4 steaks 1/2 inch thick. 3. Cover and refrigerate. The original recipe says to let it marinade for a minimum of 4 hours but I have done it for only about an hour and it still tasted fantastic. As with any marinade the longer the better, but you don't have to do it for 4 hours if you don't have that much time. "God gives different moms the grace to do different things..."
Thank you for introducing us to your friend! I will definitely delve into her blog more! your little girl is beautiful.